Let’s just start there, okay? And a bucket of lemon dill dressing. I like it when things are a little more fun, a little more convenient, a little more real-life-able. Which is why this post is actually called Summer Salad Jars. As in, let’s put this salad right on up in a jar. Do you know what’s beautiful about this? The jar thing? A) Jars. They look pretty in your fridge, and they SUPER CONVENIENT. It’s lunch in literally two shakes: shake the jar out, and toss it all up. B) The tomatoes and the dressing sit in the bottom of the jar together and actually get BETTER and JUICIER and MORE FLAVOR LOADED the longer they sit in the fridge. The quinoa, too – it can handle that little bit of moisture from the dressing! Think of that lemony, garlicky, dill-punch of flavor just hanging out in there, giving your quinoa the royal treatment. How about a YES MA’AM on that one. I haven’t been a huge supporter of jar salads in the past because I was skeptical that a lettuce salad, sitting a jar with a bunch of stuff for four days, would really be a good thing to eat. But this is not a lettuce salad. That’s why I’m into it. It has the extra-delicious texture of a deli-style salad (you know, chicken salad, potato salad, that kind of thing) and all of its ingredients are sturdy enough to handle the weekly fridge sit. 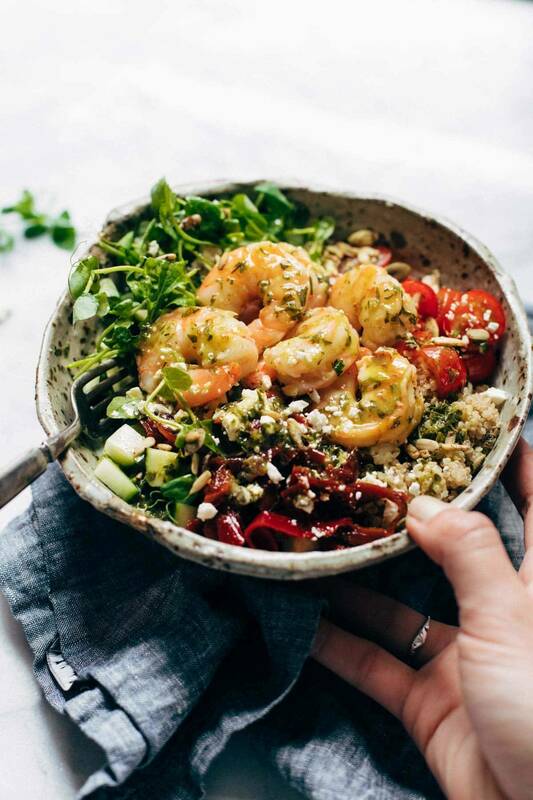 And should you find yourself lacking for dinner, throw a few shrimp on the grill and pop em on top of your salad, with a few delicate curlycue greens in there for Instagram reasons. Riiiight?! Are we not so hot with this right now? Okay, easy meal prep. This week. Quinoa, veg, lemon dill dressing. Very healthy, very goals-y. You got this! Please report back. Dressing: Blend all dressing ingredients together until smooth. Grains: Cook quinoa according to package directions. Set aside to cool. Build Your Beautiful Jars: In each jar, layer a little bit of dressing, tomatoes, quinoa, cucumbers, sun dried peppers, and feta. Store sealed jars in the fridge up to 4 days! Serve: When you’re ready to serve, empty the jar into a bowl. Stir to combine. Voila! I love dill, and I never measure it exactly. For those who do want to measure, I would guess my “handful” is equal to a loose 1/4 cup! Same for the parsley. This is also delicious made with whole wheat orzo or other cooked pasta! I like to add some finishing touches, too – extra salt and pepper, more lemon juice, fresh greens, and maybe some sunflower seeds for crunch! Yummy! You can totally add some cooked chickpeas, lentils, a piece of grilled chicken, fish, or shrimp added to the salad after it’s all mixed (as pictured). Personally I would wait to add the chicken/shrimp until just serving so the salad jars stay fresher for longer! YUM! Is this the recipe I saw on your instagram stories? I’ve been looking forward to this recipe! Love the summer produce and meal-prep aspect of it! These look perfect for summer and jars do look pretty in the fridge. This are on my to do list, yum!!! Hope you enjoy them, Ana! looks like the ultimate summer salad in a jar! mmmm! Love the use of jars here! Are nutrition facts being added? Thank you!!! How much fiber per serving or per recipe? OOOH that lemon dill dressing sounds amazing! Does the 2 cups quinoa mean cooked or uncooked? Uncooked! You’ll cook it in step 2 of the directions. This is amazing, I heard of this jar for the first time.But to be honest It looks amazing.These jars are the best to carry a salad and this is something exceptional. Salads are SO tricky to store ahead of time because it can be really challenging to alleviate soggy lettuce. That’s why mason jars are so fantastic! Love that this recipe also contains quinoa. Next time I make a mason jar salad, I’ll omit the feta cheese but replicate this completely otherwise! Might add some peanuts and tofu too! So glad to hear that, Natasha! Do you think you can freeze any excess dressing ? I can’t wait to try this recipe! It looks delicious! What size jar do you recommend using for this recipe? We used the pint-size jars! Love this! Can you help with approx how much dressing etc should go in each jar? I’m making these for someone recovering from surgery and want to make sure I get it right! About 2-3 tablespoons, or closer to 1/4 cup if they like a lot of dressing! I made this in a bowl to take my son’s double header baseball game last night. I layered quinoa and tomatoes with a little dressing on the bottom. I topped that with massaged kale, garlic roasted chickpeas, cucumbers and feta cheese. I took along some extra dressing for the top. First off, I was getting looks of envy from the other parents. Second, it was AMAZING!!! This is a summer meal at its finest! I forgot to add that I also used sundries tomatoes on top. That took this salad to another level! You’ve been teasing us with this on Instastories…it looks fantastic! Love the idea of adding shrimp. Or maybe chicken? YUM. Back in the 1980’s, my grandmother who’s now deceased used to can homemade pickles in a mason jar. Then from time to time, I assume she would ferment other foods in a jar. Canning is a great way to stay laser focused not only with eating the right healthy foods, but also consume food in rightful portions. This way, eating portion-controlled food out of a jar or otherwise will be friendly on your metabolism to digest. May I ask where these pretty bowls are from? Thank you for another great recipe!!! !